I found this recipe 30 years ago on the back of a Golden Grahams box, and even though I was only about Fuzz’s age, I was smart enough to know that something made with dry breakfast cereal could never come close to the real thing; because If you think about it, s’mores are the perfect dessert –- gooey, chocolaty, multi-textured & flavored and almost always served in happy circumstances. For instance, you never find s’mores at business meetings or funerals. They’re for campouts or cozy happy nights at home with the family. Plus, you get to set things on fire while you eat and if that’s not fun, I don’t know what is. So the idea of indoor s’mores made with cereal was just kind of “meh”. Well, today I’m feeling kind of “meh”. The rest of the family went to a water park and I can’t get my ears wet and have to stay home. Staying home isn’t a bad thing because there’s lots to do here, but I’d rather be going down a water slide just like I’d rather be burning marshmallows than melting them in a pan and dumping them on cereal. But life is not perfect and sometimes you have to make the best of it so Indoor S’mores, the one recipe for which I had all the ingredients on hand, were perfect for the day. They don’t taste like real s’mores, but they’re pretty good in their own right and have an interesting look. I thought they tasted much better cold, so I’m keeping this batch in the refrigerator to see how long it will take for them to become soggy. UPDATE: Kept these in the refrigerator and they were still great the next day! I definitely liked them better cold and sogginess wasn’t an issue. 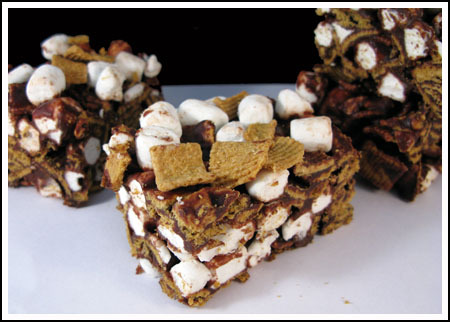 Indoor S’mores are a no-bake cookie made with Golden Grahams cereal. Line a 9x13 inch pan with nonstick foil or line with foil and spray with cooking spray. Heat corn syrup and butter together in a saucepan set over medium. When mixture begins to boil, add chocolate chips, reduce heat to low or turn off completely, stir until melted. Stir in vanilla. Pour chocolate mixture over cereal, coating it thoroughly, then fold in the marshmallows, 1 cup at a time. Press mixture evenly into a pan, sprinkling extra cereal and marshmallows on top for contrast, and then let stand until firm – about 1 hour or stick them in refrigerator so they’ll firm up quickly. I did that because I was impatient, and it worked out well. In fact, I liked the bars better cold. You can also halve this recipe and make it in a square pan. I made these just now. I took your advice and poured the cereal first. I mixed 1 cup semi with 1cup bitter chips-I didn’t want to go too sweet on the chocolate since there is corn syrup too—they are delicious!!! Husband had to stir everything in though…I told him it was aerobic exercise…he didn’t buy it. I did use a scant 3 cups mallows and 8 cups cereal because I love chocolate!!! I bet you could add salted peanuts to these and they would be good too, but not smores anymores! Gloria, I was surprised at how much I liked these too. Since you don’t like bittersweet, maybe you could try these with milk chocolate. These bars look good!!! I bought a plate of bars like these at a bake sale yesterday. They were so crunchy/crispy and chocolately I didn’t stop eating them until I nearly got sick! I think they used bitter chocolate though and I’m not a fan. I will make them using semi sweet or maybe 1/2 and 1/2 which will probably kill me. Dealth by smores bars…Could be worse…. I got that recipe from my sister, but didn’t know the origin of it. It’s pretty addictive, isn’t it? Pam, I think that’s the one I use. It’s from Hershey’s and it’s great! I wanted to try the Golden Grahams version because I’d wondered about it for years and had some Golden Grahams. Here’s a S’More’s Bar recipe I like. It’s also really good if you warm individual bars for 15-20 seconds in the microwave. Preheat oven to 350 degrees. Spray an 8″ baking pan with cooking spray. Beat butter and sugar at medium speed until creamy. Add egg and vanilla, beat until combined. In a small bowl, combine flour, graham cracker crumbs, baking powder and salt. Add to butter mixture and beat until combined. Press half of dough in prepared pan, spreading evenly. Place chocolate bars on top of dough, breaking apart as needed to create an even layer. Spread marshmallow creme over chocolate bars. Spread remaining dough over marshmallow creme. Bake for 30 to 35 minutes. Cut into squares to serve. Best served warm. Those actually look outstanding. Let’s see how your overnight experiement turns out. Good looks to be sure. But I think I’ll try these out, it seems interesting. Recently I made s’mores on my gas stovetop. I put 4-5 chocolate chips on a whole wheat Ritz & set it aside. Then I toasted a marshmallow on a long fork over the flame. I slid it onto the cracker & put another cracker on top. Not quite the real thing but pretty darn good & only took a couple of minutes. Plus it was easy to hide the “evidence”. Happy New Year–if you are celebrating! Golden Grahams was always one of my favorite cereals, yet I know what you mean–it still is ‘cereal.’ I hope tomorrow is better. Perhaps a big bowl of these in milk for breakfast with some M&Ms on top? I love golden grahams cereal. Bet those bars are pretty tasty too. I love the flavor combo in Smore’s I just made some Smores bars the other day, the same recipe I usually use but these look great. I love the idea of using cereal, i just never have it on hand.